What makes you stand out as a future collegiate athlete? The big rangey junior plays TE and DE – over the last year he’s gained 10-15 pounds while seemingly increasing his quickness. He has the right frame to keep on adding weight, and should be well over 250 in no time. His length makes him very hard to block and he gets solid leverage on the lineman. Very physical with his hands. Junior year we are seeing him have a larger impact reading the QB’s eyes and disrupting short passes. 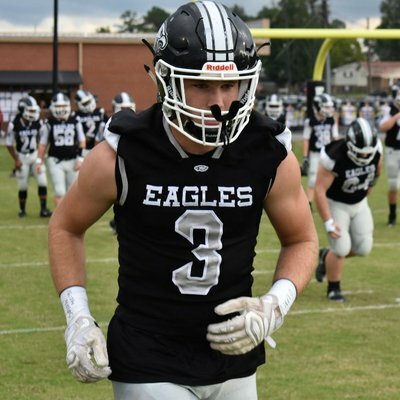 Against Rockmart he had 2 catches for 50 yards, which was capped off by a tremendous truck over a defender and a score, making the top 5 plays in Georgia for that weekend. Brown is dominant on either side of the ball, but after watching the junior get after it as a run blocker, you can see his elite potential as a tight end. He was dominant in the camp circuit last offseason, and we expect similar success for this upcoming one. His blocking is the best of any of the TE’s in Georgia.